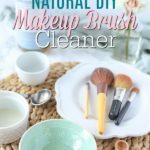 DIY makeup brush cleaner is a natural and effective way to clean makeup brushes of makeup and bacteria. 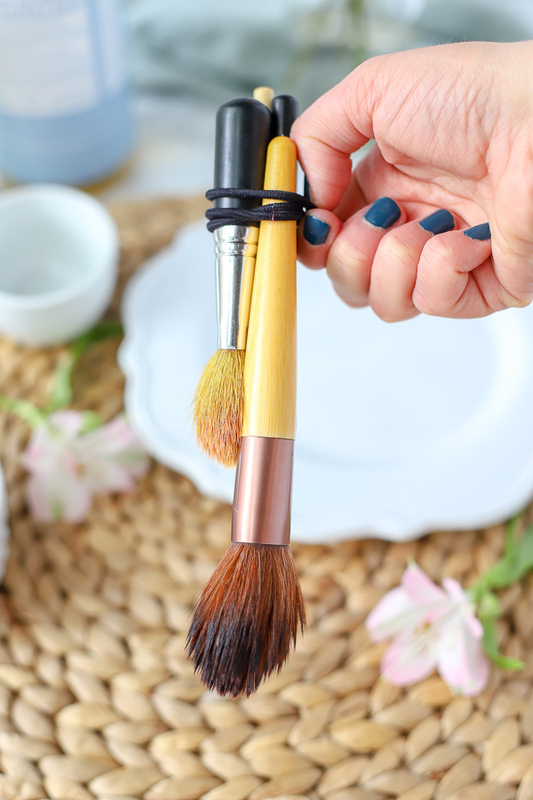 It takes just two simple ingredients to make this homemade makeup brush cleaner and it can help leave you with clearer skin. Like it was getting to the point where they were so dirty it was embarrassing. So here I am calling myself out of my filthy makeup brushes. It was really only embarrassing to those who saw my brushes… so me and me alone. Now, I could have easily run to the store to buy pre-made makeup brush cleaner. But I knew I could create a recipe that was just as good, if not better. That was super inexpensive. And of course, natural. Doing a quick search on store-bought brush cleaners there were a few good options. There were also some really bad choices. Fake fragrances and parabens which have been linked to hormone disruption and cancer. Plus, the options were not cheap. I like cheap… cheap and natural. Why is it important to clean makeup brushes? Dirty brushes can harbor bacteria and oil which can lead to clogged pores and breakouts. But the extra makeup residue can make makeup brushes lifespan lower. Cleaning brushes can help make your brushes last longer. And if you have invested in expenses brushes you want them to last. So get to cleaning and get that grime off your brushes. How often should you clean your brushes? You should clean your makeup brushes at least once a month. Some people claim more while some say less. I would say at least every month or two should be good. If your brushes seem to get dirty quickly wash them more, like every other week. I may have gone wayyy to long without cleaning them. But now that they are clean, you bet your bottom I’ll be keeping them cleaner. They work so much better when they are clean. Water: helps distribute the other ingredients. Oil– almond, olive, or jojoba oil will work. Oil helps break down any oil makeup left on the brushes. It will also help condition the bristles. Castile soap: this is a natural soap to help clean and dissolve the gunk out of brushes. Tips for cleaning makeup brushes? Hang the brushes up so the bristles are facing down or lay flat to dry. Don’t lay the brushes on their bristles or upside down. 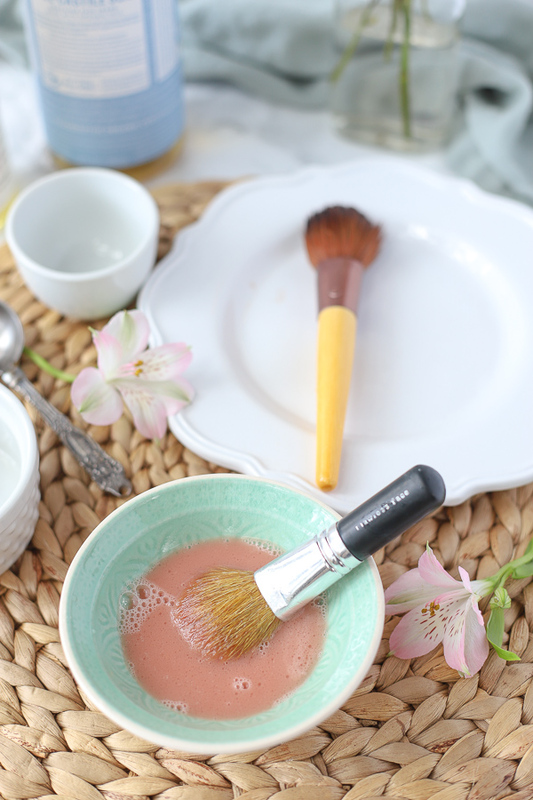 Use homemade makeup brush cleaner every 3-6 months to ensure makeup brushes stay clean and fresh. If your brushes are really dirty you may have to repeat the process. Ready for it…. It’s so easy. Mix together castile soap, oil, and water. It is ready for cleaning! See so easy. If you have a lot of brushes or really dirty brushes you may need to make a double or triple batch. 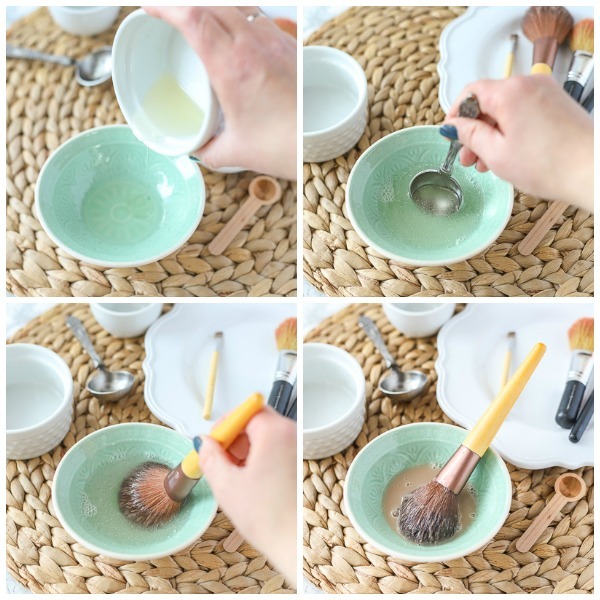 Mix together homemade makeup brush cleaner recipe. Take dirty makeup brushes, one at a time, and mix into the solution stirring well. Rinse under cool to warm water until water runs clear. If the brushes are really dirty you may have to repeat this process. 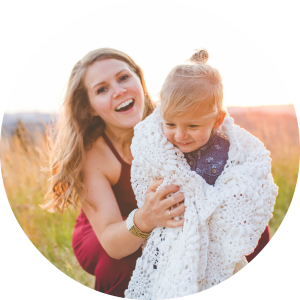 Love homemade products? Check these out! DIY charcoal face mask is a hydrating and tightens the skin while detoxifying it. Natural DIY Pomade is a natural hair styling wax. I love this shea butter and aloe face cream. This is the best homemade hair gel for soft curly hair. Simple, natural, and cheap ingredients come together to make this easy recipe. Love this recipe? I would love if you would leave a comment and give it a 5 star rating. Tag me on Instagram @ablossominglife if you try this or any recipe and I’ll share it. Mix castile soap with oil and water. Dip brush in makeup brush cleaner, swirling them into the cleaner until makeup has come off. You may need to use your fingers to break up any big chunks. Once you feel like the majority of the makeup has been removed, rinse makeup brushes under cool water until the water runs clean. Hang brushes to dry. Tying them together with a hair band and hanging them from a hook works well. Allow to dry for 8 to 12 hours. Use as you normally would. 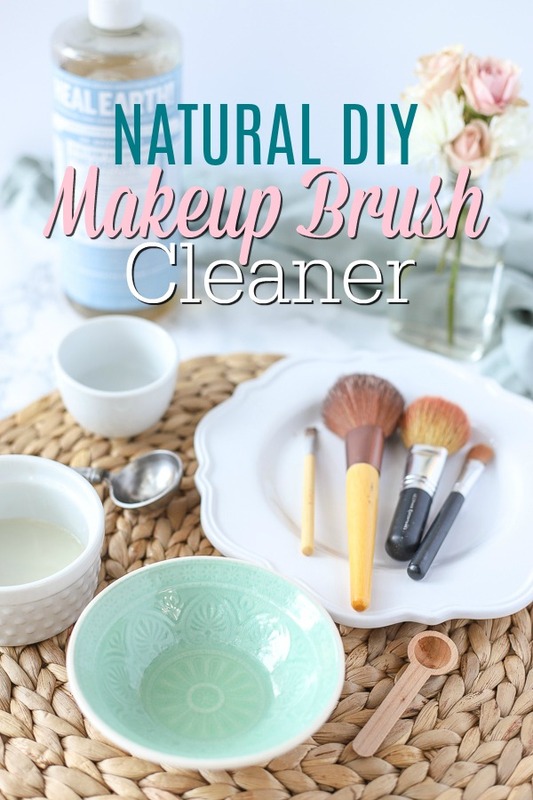 Do you desperately need to clean your makeup brushes? Have you tried to do it yourself?